If you’ve ever tried a profiterole, éclair, or gougère, you know the light, airy joys of choux pastry. What you might not know is how easy it is to make—even gluten-free— and how impressive the results are. So go ahead. 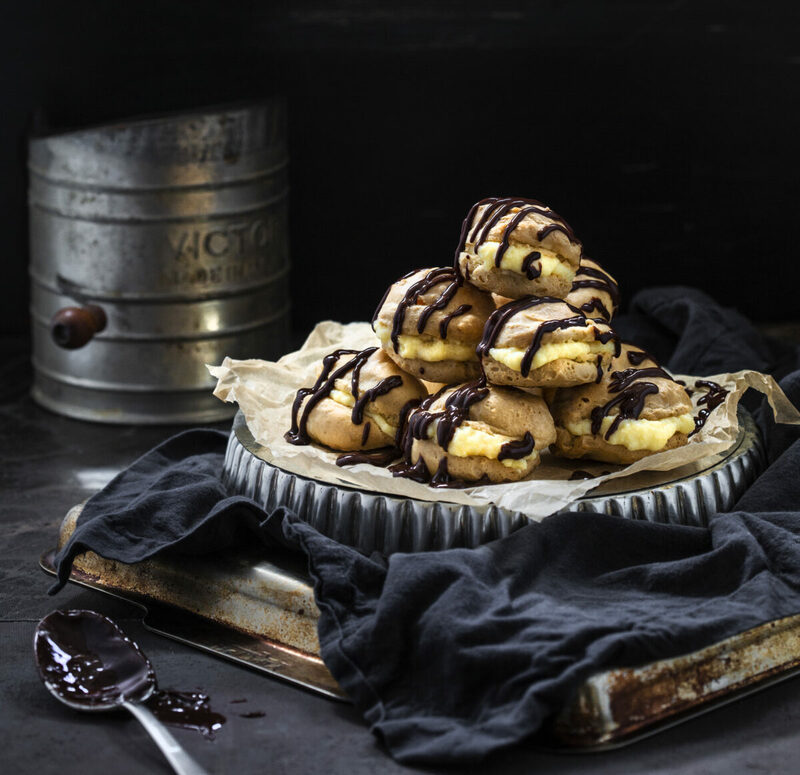 Have a ball with these obsession-worthy gluten free cream puffs you’ll want to make again and again. This recipe can also make 8 chocolate éclairs, if you pipe, bake, and fill long strips of batter rather than dollops; or gougères, if you beat 11⁄2 cups Gruyère or cheddar cheese into the batter after adding the eggs. Puffs may be made 2 days ahead, kept in an airtight container, re-crisped in a 400°F oven 5 minutes, then cooled before filling. In a heavy saucepan over high heat, bring to a boil 11⁄4 cups water, the butter, and salt. Lower the heat to medium. Add the flour, remove from the heat, stir vigorously to combine, then return to the heat, stirring, for 1 minute. Transfer the batter (a.k.a. pâte à choux) to the bowl of a stand mixer fitted with the whisk attachment. Let cool for 10 minutes. Beat in the eggs, one at a time, on high speed, until combined after each addition. Don’t worry if the batter is clumpy, like scrambled eggs, at first; it will come together. After the final egg has been combined, beat for 2 minutes more. Preheat the oven to 425°F. Line two baking sheets with parchment paper. the temperature to 400°F and bake 20 minutes more. Remove from the oven. Using a skewer, poke 1 (1⁄4-inch) hole into the bottom of each puff to release steam and help retain crispness, then return the puffs to the turned-off oven for 30 minutes. Split each puff in half to make top and bottom pieces. Scoop a heaping tablespoon of pastry cream onto each bottom piece, add a top piece, drizzle with chocolate ganache, and serve. Optional corn syrup ensures this chocolate sauce stays shiny. Use it right away or refrigerate, covered, for up to 3 weeks, then reheat before use. Place the chocolate chips and corn syrup in a bowl. Heat the cream in a small saucepan over moderate heat until it just begins to bubble around the edges, but does not develop a skin. Pour the cream over the chocolate chips and stir until smooth. Pastry cream can be made up to 3 days in advance and refrigerated, with plastic wrap sealing its surface then covered. Pour the milk into a heavy-bottomed saucepan. Sprinkle in 1⁄4 cup of the sugar, letting it sink, undisturbed, to the bottom. Without stirring, bring the milk to a very gentle simmer over medium heat, 5 minutes. In a medium bowl, whisk together the egg yolks, cornstarch, remaining 1⁄4 cup sugar, and the salt. Whisk the hot milk mixture, then gradually whisk it into egg yolk mixture. Return the mixture to the saucepan and cook over medium heat, whisking constantly, until the pastry cream simmers and thickens, 2 to 3 minutes. Remove it from the heat, then whisk in the vanilla and butter until smooth. For smoothest results, pour the pastry cream through a fine-mesh strainer into a bowl, using a rubber spatula to gently force it through. Cover the pastry cream with plastic wrap directly on its surface to prevent a skin from forming. Refrigerate for at least 4 hours.